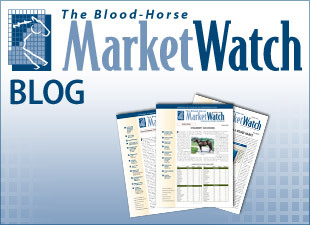 What determines value in a stallion's asking price? To some, it is the ability to produce commercially appealing offspring that sell for much more than the price of the season. To others, it is the ability to produce early winners that can get a mare's produce record started or be sold for a profit from off the track. Still others define value in a stallion as the ability consistently to sire good-quality runners. Thus, the very same stallion at some point in his career may be defined as a failure by one standard and a success by another. Value is particularly difficult to assign to a first-year sire, whose capacities are completely unknown. Take Blame, already the subject of debate on a number of Web forums. At $35,000, is he reasonably priced? In earlier years, there would have been no question that the price was fair enough given his race record and a pedigree that combines a successful sire line with possibly the best sire-producing family of modern times. But today's market is much tougher, and Blame is from a sire line that typically produces rather plain, late-maturing individuals that do not always scream "commercial." Further, he is standing alongside his own sire, already a proven stallion and available for $5,000 less. At the top end of the first-year sire market, he will also be competing with Quality Road and Lookin At Lucky, both horses that might be considered to offer more natural speed or precocity and yet have the potential to compete with Blame in producing two-turn runners. My own guess is that at his present stud fee, Blame is not likely to be a top draw to commercial breeders; while the best-looking and best-pedigreed of his progeny may command good prices from owners looking for classic prospects, he is not likely to appeal to those looking for classically handsome or quicker-maturing types. But given the quality of Claiborne's connections, the quality of Blame's pedigree, and the horse's championship credentials, I suspect Blame will have no trouble drawing a full book from owners running high-end breed-to-race operations. A better racehorse than his sire, he will receive backing from those who hope that he will be a better sire as well. Readers, what constitutes good value in a sire prospect to you? And what information do you most need to help you assess that value?